TACLOBAN CITY- At least three passengers, two of them were minors, died and scores other were hurt after the passenger they were on board fell off a bridge in Tanauan, Leyte at about 11:45 pm Tuesday. 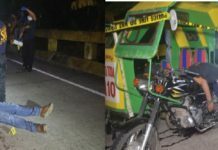 SPO3 Restituto Faron, officer-on-case of the Tanauan police station, identified the fatalities as Queenly Galagnara3; Wendell Simbajon,15; and Brian Noterte,30. The three fatalities were among the 52 passengers who on board a Philtranco Bus Line with plate number ACA 9771 which was cruising along Barangay Buntay of said town when it fell into the Solano Bridge by about three meters, Faron said. The three were declared as dead on arrival by the attending physicians while the other passengers sustained injuries who were brought to different hospitals at the nearby town of Palo and here in Tacloban City. Queenly was with her grandparents, Pepito and Marites Galagnara with address of San Jose, Dinagat Island, while Simbajon was with his father, Willy, who was said to be the assistant driver and with address of Dumoy, Davao City. 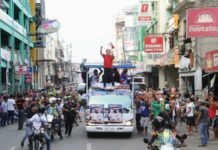 The address of Noterte was not known. “Many of the passengers are now at an evacuation center in Brgy.Canramos as ordered by Mayor (Pelagio) Tecson for the meantime as they are recovering from the injuries that they sustained due to the incident,” Faron said. The police officer said that the passenger bus, driven by Edgardo Legaspi, was from Pasay City and bound for Tandag City, Surigao del Sur. And based on their initial investigation, the driver claimed that a passenger whom he identified as Wendell Simbajon tried to grab the steering wheel from him, causing him to lose control of the vehicle which resulted for the bus to swerve going down to the bridge. “But I doubt it. Most probably, Wendell could have awaken from his sleep and fell straight to the driver. He (Simbajon) was sitting at the back of the driver,” Faron said. The passengers were rescued by the town rescue group and local police.